Please make a reservation 1 week prior to the lesson date. Please notify cancellation, 2 days before the lesson date. We do not take entrance, annual membership fee. Please pay by cash. Credit card is not accepted. All necessary equipments will be prepared, so no need bring anything. You can take the work in plastic wrap after the lesson, and give it as a present. Trial 1-day lesson is for the absolute beginner and offers the opportunity to make the stunning flower arrangements with United Bouquet style. 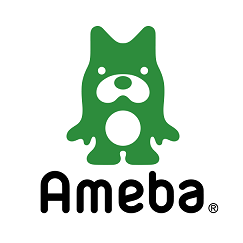 In the lesson for Mother & Child, students can create the lovely arrangements using the mascot for kids. Children also are able to work on it with their pace. Please feel free to share the flower design which you are interested in. 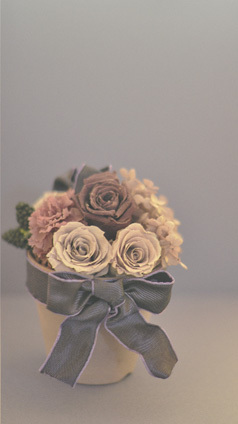 Through this course, students can enjoy the united bouquet style. 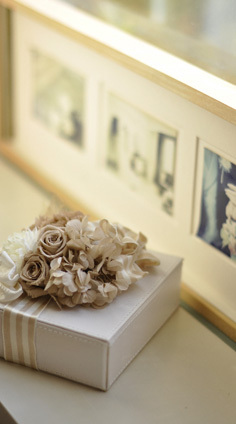 Especially by using ribbon in various way, the image of flowers will change. The basic course is designed for the beginner level. Students learn the knowledge to handle and arrange the preserved flowers correctly and also learn the basic skills such as wiring, taping etc. Through this course, students master the basics of United Bouquet style. On completion of the course, students will receive a certificate. 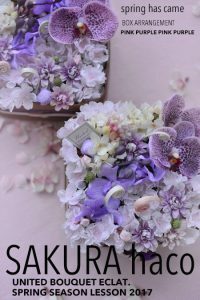 In this course, students take the skills and techniques to the next level and develop their sense of stunning floral design by United Bouquet. The well-designed curriculum enables student to use the varieties of ornaments and flowers which require more techniques for the arrangements. On completion of the course, students will receive a certificate. This course is for those who wish to become professional and/or to open a preserved flower class in the future. The course leads students to the position where they can use the various techniques and make the creative works as well as improve their works respecting their originality. On completion of the course, students will receive a certificate.